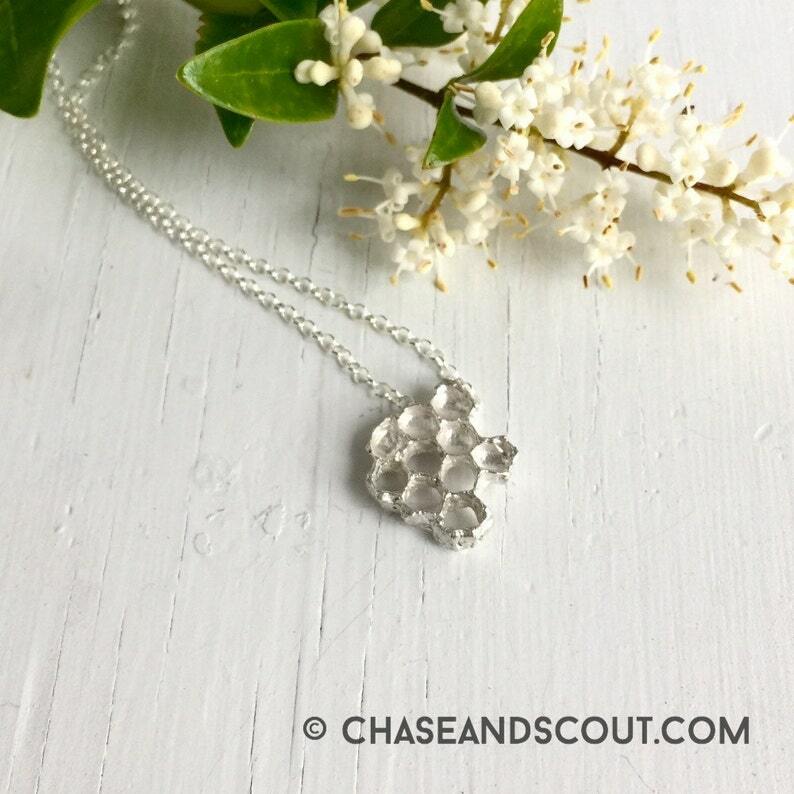 Solid sterling silver honeycomb, hand cast from a real honeycomb this fine polished slice of beehive is a lovely gift for your honey or a devoted lover of bees. Comb measures 3/4 x 3/4 and is suspended on a 20" fine sterling silver chain with a delicate sterling silver lobster clasp. No two are identical, please allow for variances as part of the handmade process. Ships giftboxed and ready to wear. One maker, one designer, handmade here in the US. Please allow up to two weeks creation time prior to shipping. All of my newest designs are only available through ChaseandScout.com, this Etsy shop contains just a small selection of Chase and Scout classics. Blending the beauty of the dark and the light, Chase & Scout jewelry is proudly handmade using traditional metalworking techniques with an intention to create heirloom pieces that will last a lifetime and beyond. Please do not copy, or reproduce my designs. Please do not reproduce or duplicate my images without written consent. I love it so much...Thank you for your beautiful art! This Honeycomb Necklace is so unique and gets so many compliments. I am so happy to have such a beautiful work of art to wear! Thank you!! Has a cute clasp on it too! It's definitely bronze, not gold like it seems to be in the photo and I wish it was a little longer but overall a good choice!